Well for those of you who have stayed with me on this odyssey of signaling across Pennsylvania we have reached the final leg of our Journey between Greensburg, PA and Pittsburgh itself. The daylight was beginning to fail at this point so I apologize for the decreased photographic quality. The relevant track charts for this segment can be found here. 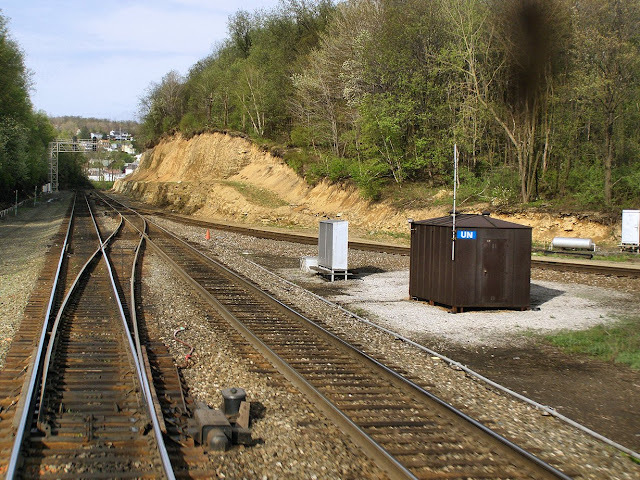 Beginning at Greensburg it is worthwhile mentioning an interesting feature of the right of way that important to the signaling in the area. You may have noticed in part 3.2 that SW tower at Southwest Junction had a western section where the 4-track right of way shrank to three tracks for a pair of tunnels. I mentioned that past CP-CONPIT the main line took off overland across a plateau to reach Pittsburgh directly instead of following the Conemaugh River. 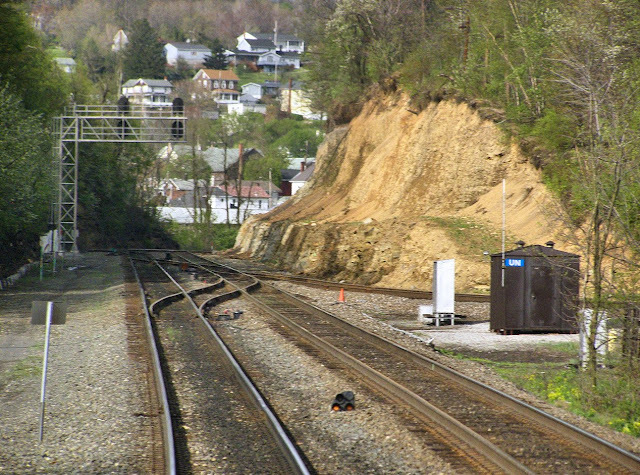 This resulted in a steeper grade profile as well as a number of bottlenecks in the Greensburg area in the form of tunnels. The first was located directly east of the station and was eliminated in the 1890's, the second set of tunnels hung around a lot longer and remained an operational headache. Known as the Radebaugh tunnels after the community west of Greensburgh (which had its own tunnel) the first was built in 1852 as part of the original Main Line project and nearly derailed the entire enterprise as the cost and delays of tunneling began to give the Philadelphia area investors cold feet. 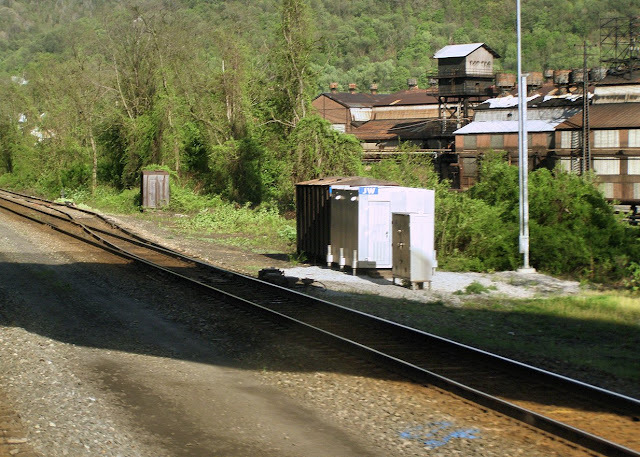 The original tunnel was very tight and built on a curvy alignment through the local drainage divide between the Conemaugh and Monongahela rivers. In the 1890's a new, larger tunnel was built on a more direct alignment, at first replacing the original tunnel until traffic levels pressed the 1850's bore back into service to carry a third main track. You can see the two tunnel alignments on this Wiki Map. Still, three tunnel tracks on a four track line a bottleneck makes, but adding a 4th track or simply removing the tunnel never became a priority for the PRR so they did the best they could with interlocking design. Directly on each side of the new 1890's tunnel the 3 tracks shrank to 2 via a parallel shift layout with freight track 1 having the forced diverge at each. Track #4, also designated for freight, used the pimple alignment of the 1850's tunnel allowing the designated passenger tracks 2 and 3 the straight shot through. In 1965 the waning PRR showed some of its old magic when new tunnel was daylighted in a project where the overburden was first removed and then in the space of 11 hours the tunnel roof was blasted and track re-laid with the RoW being widened over time. Track #4 remained in use through the old tunnel on the alternate alignment until the deluge from Hurricane Agnes collapsed it in 1972. The 1980 CTC project under Conrail did the rest permanently making the line two-tracks. Anyway as I said all this was relevant to signaling as both SW tower east of the tunnels and RG tower, west of the tunnels, were built to deal with the bottleneck. Here we see the location of the new tunnel now just an open cut. In the right of the picture there is an interesting signal facing away from us for traffic on the branch line which is labeled R08. This is a distant signal to the upcoming interlocking and a vestage of the old PRR Manual Block system. In this view taken in 2004 we see R08 in its original configuration as a PRR Position Light. This signal could display, Approach Medium, Approach and Caution. Approach Medium would display when a train coming off the branch line was had a proceed indication like Medium Clear and Approach would display if the interlocking was showing a Stop indication. 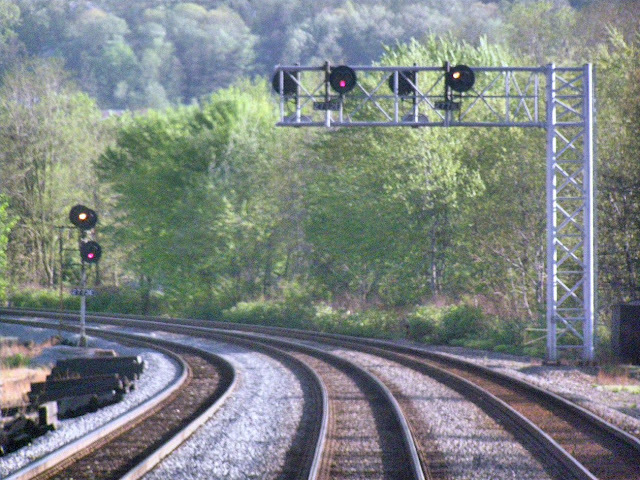 Both would show that the track circuited approach block was clear, however if it was not the signal would display a Caution signal which on a PRR PL is \ over a marker light as shown in this photo. Under NORAC the old PRR signal aspect was joined by other fixed distant styles such as the traditional yellow semaphore held at / with an (A) plate and a single yellow lamp also with an (A) plate. As the owner of the interlocking is responsible for maintaining the distant NS eventually got fed up with supporting a full PRR PL at R08 and "upgraded" it with the single yellow lamp variety sometime around 2006. Here is a front view of the new Approach Restricting signal from Railpictures.net. Not quite the same is it. Ok, finally moving on we get to CP-RADE, formerly RG (RadebauGh) interlocking. Built in 1890 as part of the tunnel project RG complimented its neighbor SW and there were actually no intermediate signals between the two. The two towers had to work together to signal trains on the bi-directional tunnel tracks. When built in 1890 electricity was still new-fangled so there wasn't much of a power grid around to power the electro-pneumatic interlocking machine, air operated points and track circuits so RG was actually build with a railroad owned and operated power plant behind it. Pretty amazing that back in the day railroads had to act as both telecom outfits and power companies. Talk about vertical integration! Here is the original diagram of RG, you can see the power plant behind the tower. Regrettably no trace of RG tower of the power plant remain today, but unlike SW interlocking, RG interlocking is still around in the form of CP-RADE. CP-RADE lost its westbound PRR signal gantry shortly after Norfolk Southern took over Conrail in 1999. The C&S department still had a commitment to target type signals, but was forced to buy from the Safetran catalogue instead of US&S so we have the Safetran style modular lamps with a circular mounting. The main signal were also re-located a few hundred feet east to provide better visibility for approaching trains. The branch line signal remained at the same location. Note supports for the old PL gantry. Points were left pneumatic. The switch to the Southwestern Pennsylvania Railroad owned branchline is good for 30mph movements. The airline looks freshly painted next to the relay hut. The eastbound signal remains a PRR PL. The 3284 automatic distant to CP-RADE was also replaced around 2000 and I remember finding photos alerting me to the loss at that time. Signals next to a grade crossing of course creates another popular railfan location. BTW look at the grade profile. The 3304 automatics were replaced in the Conrail era. 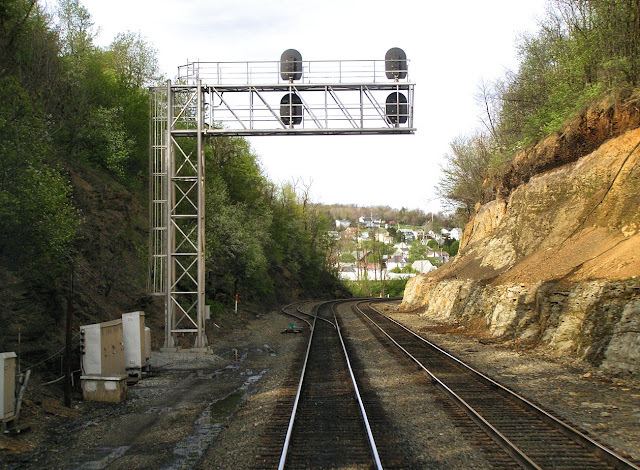 The surviving PRR gantry holding automatic signal 3326 used to be the westbound home signal of CP Interlocking at Larimer, PA. This was another mixing bowl interlocking where the passenger traffic was shifted to tracks 4 and 3 and the freight to tracks 1 and 2. This was due to the upcoming Pitcarin Yard and the desire not to have trains crawling into the yard foul the interlocking plant for passenger trains needing to cross over. 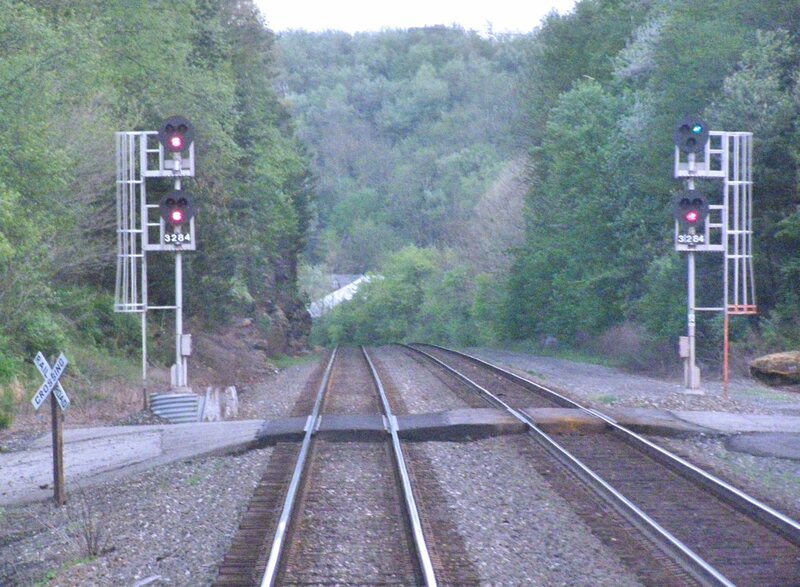 For some reason this signal supports 4-block signaling westbound despite a standard sized block length. Automatic signal 3346 is the distant to CP-TRAFF. Those of you who read my earlier essays on the signaling of the PRR Main Line might remember a bit about THORN tower in Thorndale, PA (where else!). 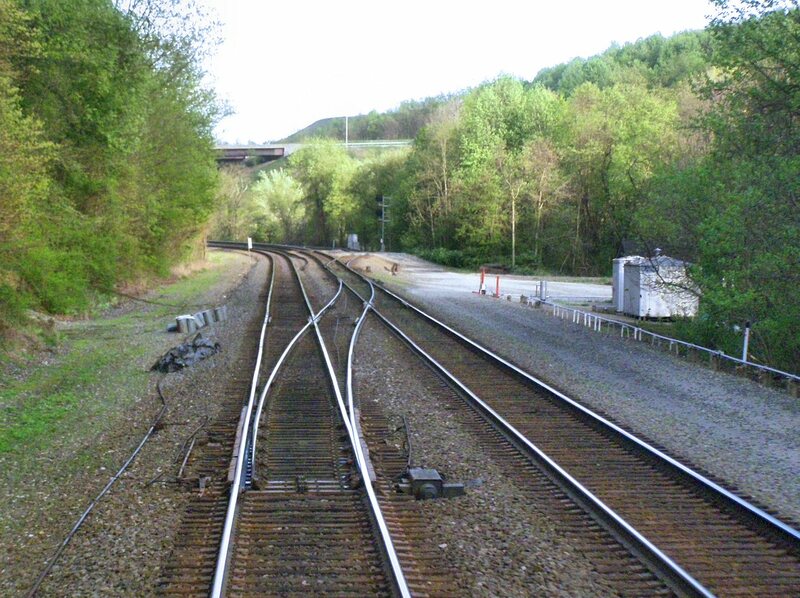 Situated at the junction of the original PRR Main Line and the Low Grade Extension of the Trenton Cutoff, THORN interlocking proper consisted of a 6-track full crossover with the two track Low Grade Extension to the east and a small yard and helper base to the west, both sandwiched in between the two main tracks of the Main Line. Today THORN tower remains active as part of Amtrak's Harrisburg Line having seen many changes over its 70 years in operation. THORN tower was built in 1938 and at the time it represented a bold form if new technology on the traditionalist Pennsylvania Railroad. 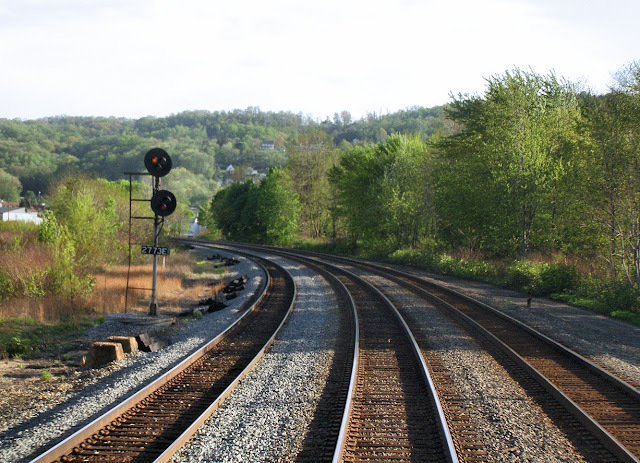 The PRR had been a strong proponent of the traditional block system with Block and Interlocking Stations spaced even intervals along the line with Block Operators passing trains from one to another. As the PRR was a wealthy railroad and could afford the expense of building interlocking plants where many other railroads would make do with hand throw switches and the Automatic Block System. As the cost of technology began to drop in relation to labor Centralized Traffic Control began to be embraced by PRR rivals such as New York Central. Intended to replace train orders on long single-track lines, CTC pulse-code technology could nevertheless allow multiple interlockings of any configuration to be worked from a single location. While the PRR would continue to rely on the individual Block Station until the end, it did install several significant CTC projects with THORN being one of them. THORN's territory stretched from MP 25.3 to MP 36.6 on the Main Line and also included the Philadelphia and Trenton Low Grade Extension between those two points as well. In addition to its own namesake interlocking, THORN had CTC control over DOWNS, GLEN and DALE interlockings to the east and CALN interlocking to the west. 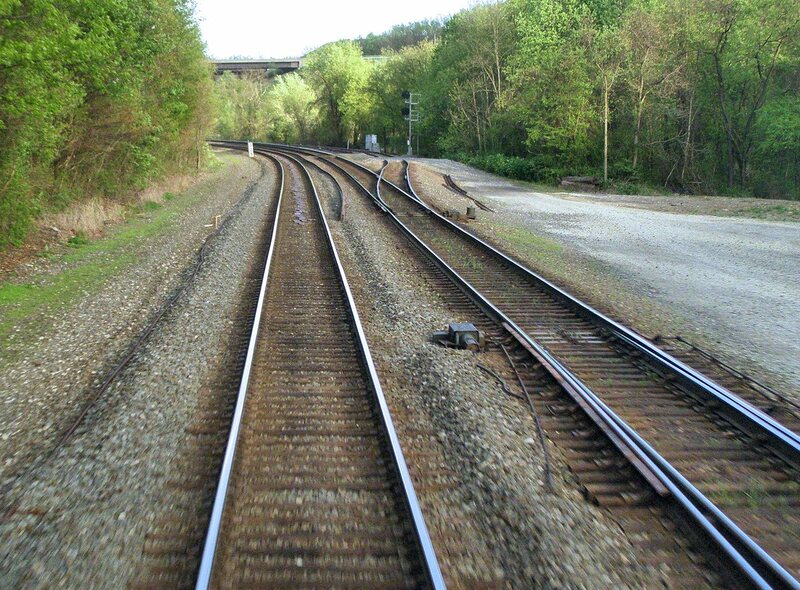 While today CTC implies bi-directional operation, the PRR was content to use the technology for simple remote control and most of the routes were left operating under single direction ABS. The Penn Central era brought some minor reductions to THORN's plant with the Low Grade extension being reduced to a single bi-directional track and the line between GLEN and PAOLI being reduced from 4 tracks to 3, with the center track being bi-directional. Under Amtrak the plant shrank further with the Low Grade Extension being completely abandoned, the Thorndale yard being almost completely removed and the 3rd track between GLEN and PAOLI being ripped out due to the loss of through freight service on the Main Line in the early 1980's. However most of the interlocking layouts were kept the same due to the costs involved with modifying the logic. Here is how the territory looked in 1992. In 1994 the closure of Paoli Shoppes due to massive PCB comtamination forced SEPTA to build a new terminal Yard in Frazer, PA for its popular R5 commuter service. This added a simple interlocking for trains to enter/exit the yard and to turn back just east of GLEN intelrocking. The old DALE interlocking, now little more than a Control Point was eliminated and the few local freight accessing the Main Line would queue up at the home signal at GLEN. 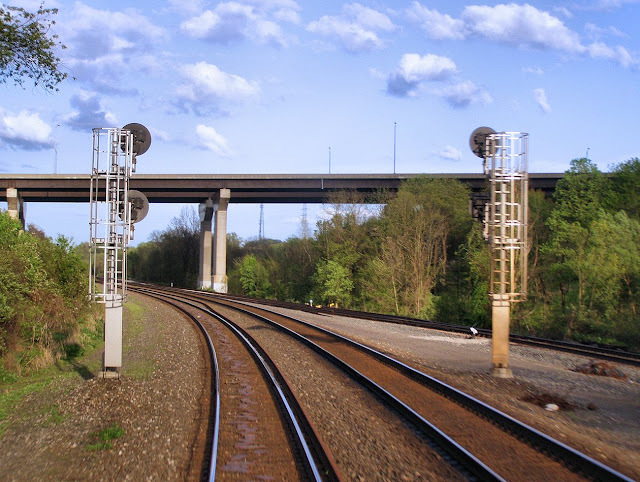 While even more changes are planned for the Harrisburg Line, in 2010 THORN and its territory are much the same as they were in 2005 when I was able to commission a survey of the tower and its interlocking plant. Some of the photos had to sit on ice for a few years, but they have been recently processed and posted for you all to enjoy. Photos that were releasable at the time were processed at a lower resolution due to the conventions of screen sizes and internet connectivity at the time. THORN tower is an identical twin to the previously discussed COLA tower, which like THORN was a PRR CTC tower built in 1937. 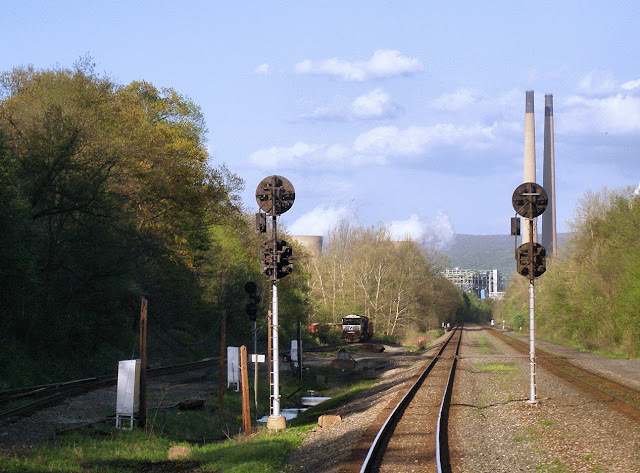 Both these towers were built in conjunction with the electrification of the PRR Main and Low Grade freight lines to Harrisburg. It is a two story brick building with no trademark bay window. It could be considered a forerunner of the 1940's towers built up and down the Northeast Corridor and discussed in the signalbox.org overseas section. The tower has a number of subtle art deco flourishes as well as a pair of interlocking illumination floodlights (one currently active). Also on the right side of the tower note the tower emergency horn which, in theory, can be used to stop trains moving through the plant. Actually its not Australia I'm talking about today, but New Zealand. Recently I had heard that a re-signaling scheme had been carried out on the Hutt Valley Line, the old signals of which actually had their own website. Well today I learned that the project only re-directed CTC control from a local US&S panel to a dispatch office in Wellington. Even better all the original relay based CTC interlockings were left untouched. Ok, that's pretty minor, but the news gets better. While the US&S Model 14 interlocking machines in the US are marching towards extinction with the recent re-signaling projects at ALTO, UNION and WB, US&S parent company Westinghouse did sell power frames based on that same technology overseas to mostly British commonwealth countries as the style L, K, N and B miniature lever frames. They are basically US&S frames just with the levers working back and forth instead of side to side (so the poor signalmen wouldn't get confused ;-) ) Anyway these are about as rare as their breathern here in the United States with only a handful of examples still in main line operation in the UK and South Africa. 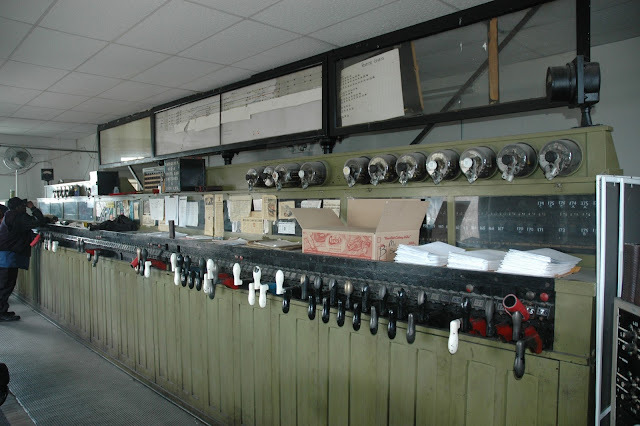 Well today I learned that again, despite some minor re-signaling, not only is the large Style L frame controlling the Wellington, NZ terminal still in service, but it was actually upgraded with three flat panel displays replacing its old bulb lit model board. Talk about a clash of technologies!! Not only does that frame survive, but so do three others on the North Island Main Trunk at Tawa, Porirua and Plimmerton with Porirua being in use daily and only Tawa being "generally known" about. Here is a page that has some more up to date information on the Style L machines in New Zealand. Anyway its nice to know that even if power frames vanish from the United States they can still be found in some nice vacation destinations overseas. And then if those go you can always check out the pneumatically actuated Style V machines installed on London Transport up through 1999!! Just saw that out on the former Southern Pacific line in Mojave, CA the MP 377 signal bridge is being taken down for what are probably justified structural issues. 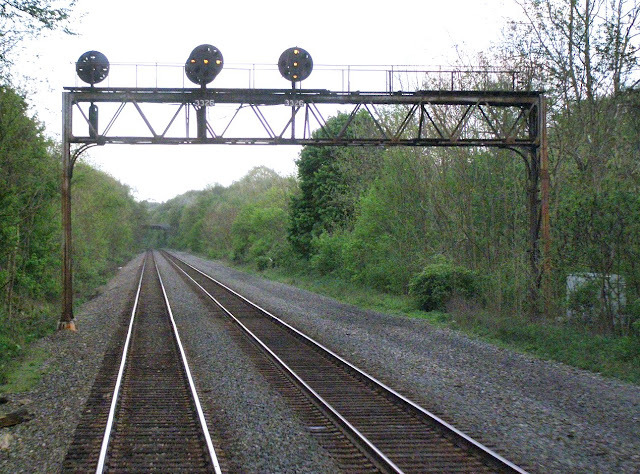 However the two track gantry with its 4 searchlight signals is being replaced with a pair of searchlight masts. Huzzah!! Finally, a Class 1 railroad that isn't afraid to Reduce, Reuse and/or Recycle. The searchlight masts definitely appear to be used, but hey, I'll take it. Well the bad news is in and if you have plans to ride the Cardinal do it now because most of the remaining C&O signaling on the main line will be gone by the end of next year. 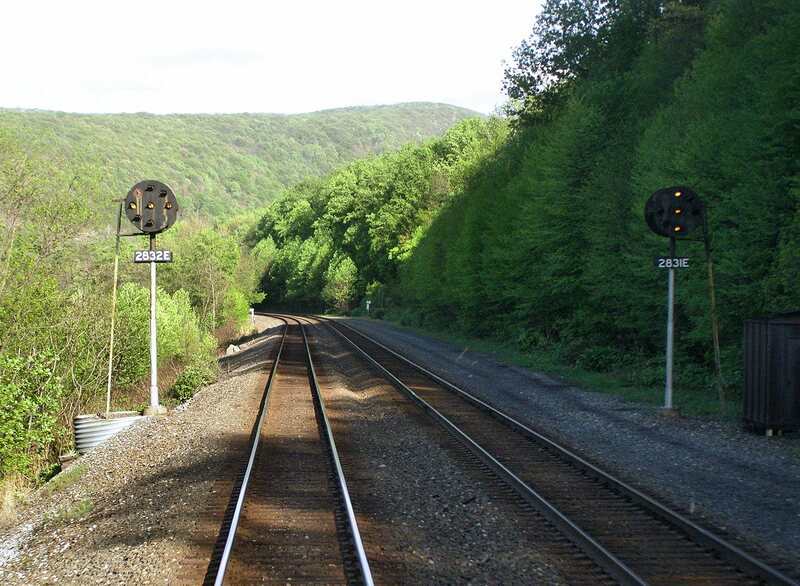 Already the signaling has been moving east from Montgomery, but I just learned that already the old signals have been removed between OX Cabin and Clifton Forge on the east slope of the Allegheny slope. Next year the plan is to fully denude everything between there and Hinton including White Sulfur Springs and the summit at Tuckahoe. Hopefully there will be something left when I ride the dome car on the Cardinal next season . I'm feeling really bad that I didn't seize the opportunity this year, although I do have two surveys of the signaling on the line of marginal quality. As we enter the final zone of signaling on the PRR Main Line I thought it might be worthwhile to summarize things a little in relation to where the signaling in each section dates from and who installed it as we travel from Philadelphia to Pittsburgh to provide a bit of perspective. 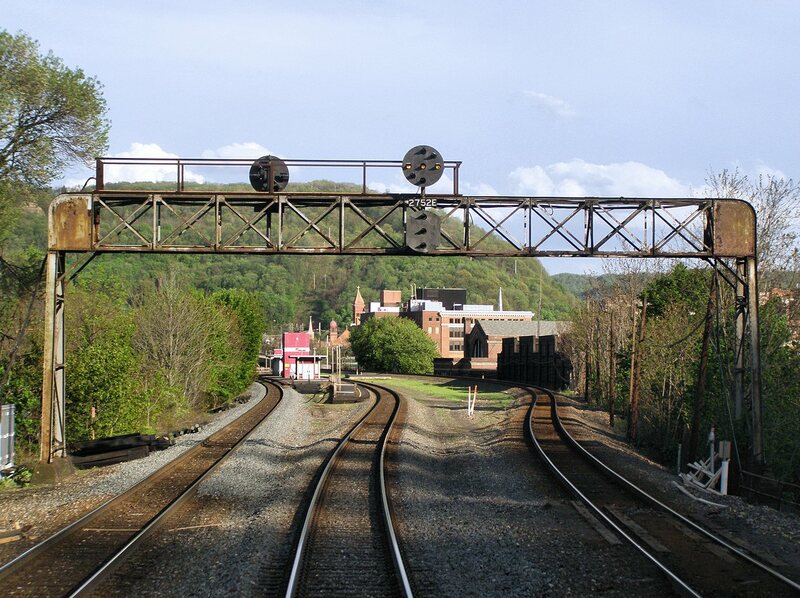 Not sure what conclusions can really be drawn here, but as we pass Johnstown we enter into the earliest of the re-signaling projects that was intended to replace the original PRR signaling. The Pittsburgh Division interlocking charts indexed at Multimodal Ways list the interlocking system used in this section as D601 (details of which I was unable to locate) and the interlocking sheets are the last series of which were hand drafted. I suspect this is a late model of all-relay based CTC technology that first became popular in the 1950's and was eventually supplanted by the new SSI systems in the 1980's. One side effect of being an early adopter was that none of the PRR signal bridges were replaced with Position Light mast signals. 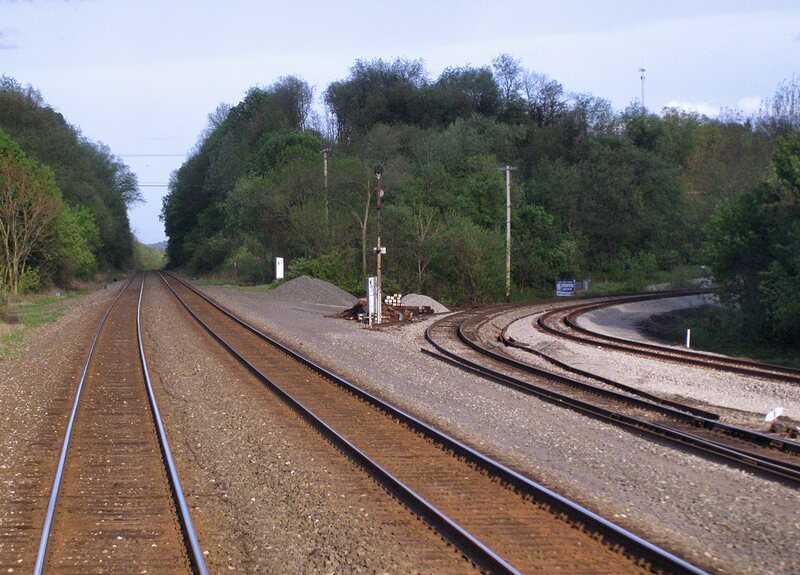 In 1980 railroads still had many first generation road switchers in service and they were designed to run long-hood forward so signals still had to be mounted to the right of the track (Engineer's Side). This meant either gantries or tall bracket masts were needed on double track CTC lines. The downside of this is that between MP 290 and MP 353 there has been significant attrition of position lights because by the time the gantries finally became life expired Conrail has stopped installing position light mast signals to replace gantries like they had between MP 105 and MP 231. We begin our journey at Johnstown on a new track diagram, but still in three track territory. Past CP-C we come to CP-JW, which used to be remote C tower with direct wire control from C's Model 14 machine. CP-JW was re-signaled when C tower was closed and had all new signals installed. Like CP-AO, CP-JW is on track 1 only and provides access to the Johnstown yard and helper base from the west. As such there is a power split point derail on the yard track. The signal on the main track is an innovative model that allows the whole signal head unit to be cranked down to ground level for servicing. 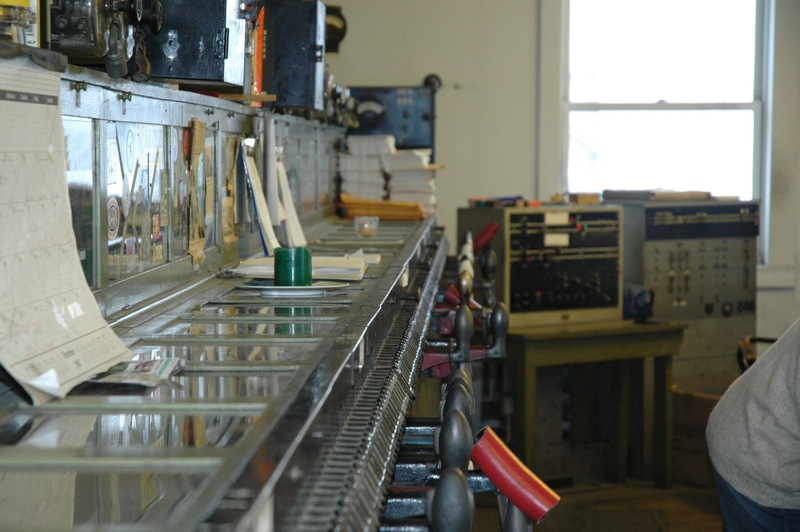 While this saves on maintainers having to climb the ladder, it requires that the signal be taken out of service, a complicated process that involves the dispatcher and transmitting paperwork to trains. Simply working on a traditional signal will simply result in a dark head, which is covered by standard rules. 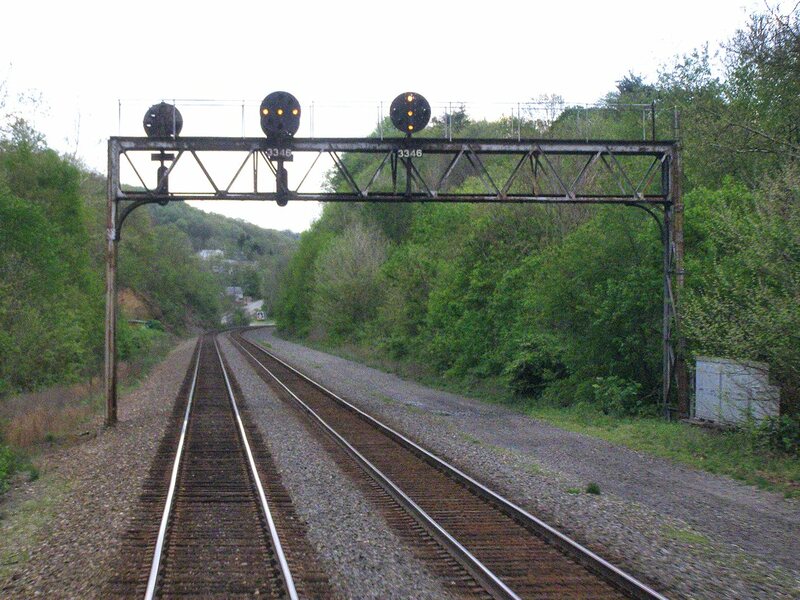 The yard track has a simple 3-stack Safetran modular dwarf signal that can display 1 or 2 lamp combinations. 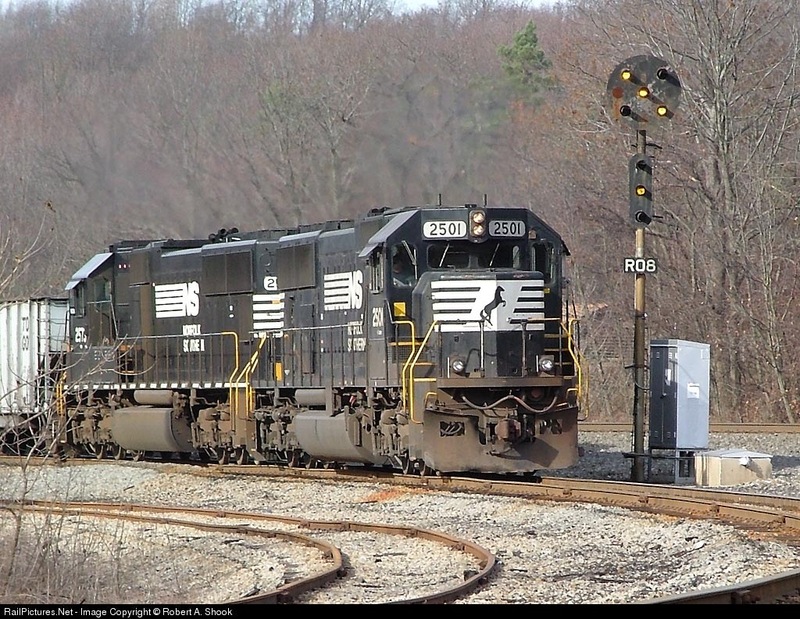 I should mention here that when Conrail re-signaled the lines it was more likely to connect the existing interlocking appliances and signals to the new vital logic controllers. 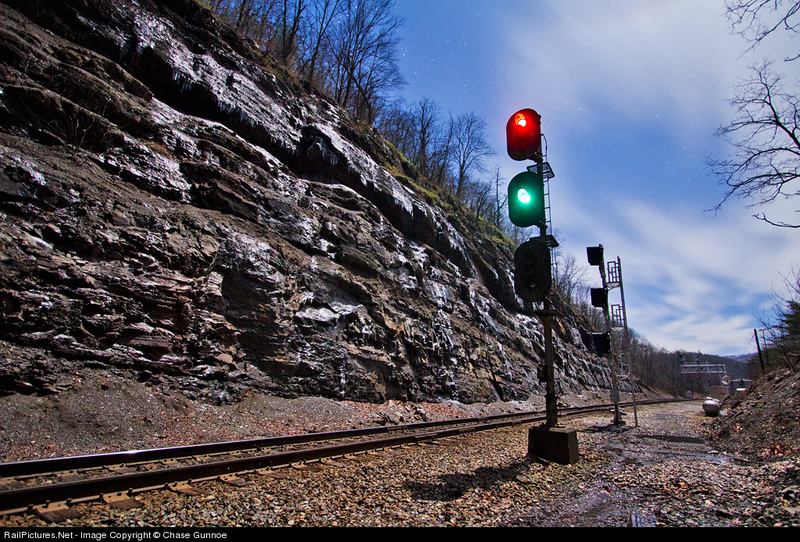 Today most railroads prefer to install brand new signals and get all the testing out of the way before taking the old signals out of service and placing the new ones in service in one go. In a literal cut-over the interlocking would have extended downtime to test all of the splices were done properly. CP-C and CP-JW were both re-signaled in this new fashion. The new relay hut was placed directly adjacent to the old one. It looks like in 2003 someone was still producing new Conrail style ID boards. A traditional mast signal was erected at the west end of the interlocking in the new NS "tombstone" variety. The switch at CP-JW leads to unsignaled territory, but CP-JW is also the track 1 distant to CP-C and grants a lower head green lamp for Approach Medium aspects. Just past the Johnstown Amtrak station we pass the 2752E signal mounted on a late model PRR gantry. 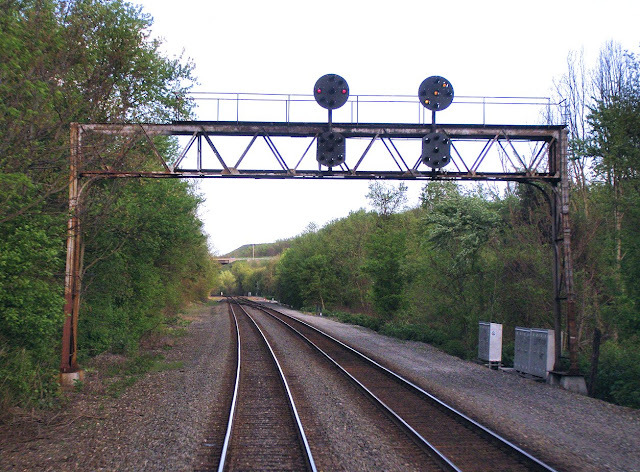 The position light signals on this bridge apply to track 2 only and it is the eastbound distant to CP-C on track 2. This section of the line had its block signals refreshed by Conrail in the 1990's so their style of re-numbering applies. I should also point out that while this looks like a normal three track line, track 3 on the left is not like the others. 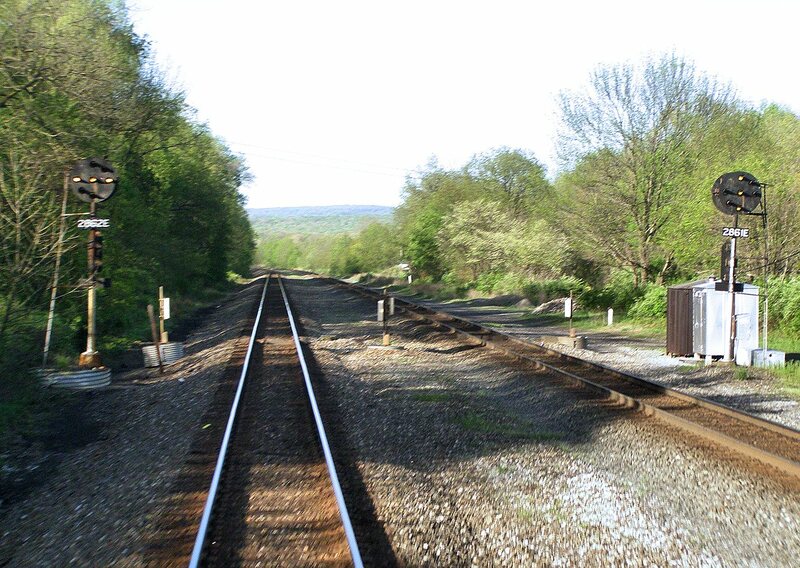 It will diverge from tracks 1 and 2 and cross the Conemaugh River to run down the other side to CP-CONPIT.Logical "Main Lines" with tracks that take different paths from point A to point B are not a unique occurrence and such tracks are often called Slow Routes or Turkey Paths. In this case the time penalty for a track 3 routing is +15 minutes and every so often this train will suffer that penalty when tracks 1 or 2 are congested. Also note where the second island platform for the Johnstown station used to sit. Today track #1 is reached with a long duckboard platform. 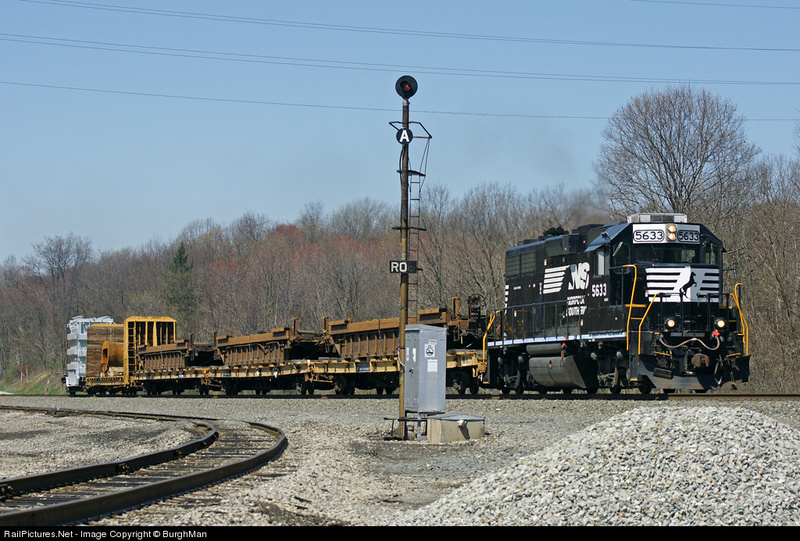 The MP 277 automatic is a Conrail install consisting of a Cantilever covering tracks 1 and 2 and a mast for track 3. This is the distant for CP-C on track 3 so we can confirm that track 3 has one less block in this segment than tracks 1 and 2 do. From the footings these signals replaced a PRR signal bridge at the same location that also used to be part of the SG tower plant. This interlocking which the old decision point for movements into the Sang Hollow Extension, which was what track 3 was known as at the time. After several additional floods in the 20th Century the Army Corps of Engineers decided to pot an end to the problem by applying appropriate protections to the riverbank . We are once again treated to position light masts installed in the 1990 refresh for the MP 280 automatic. More PLs at MP 283. 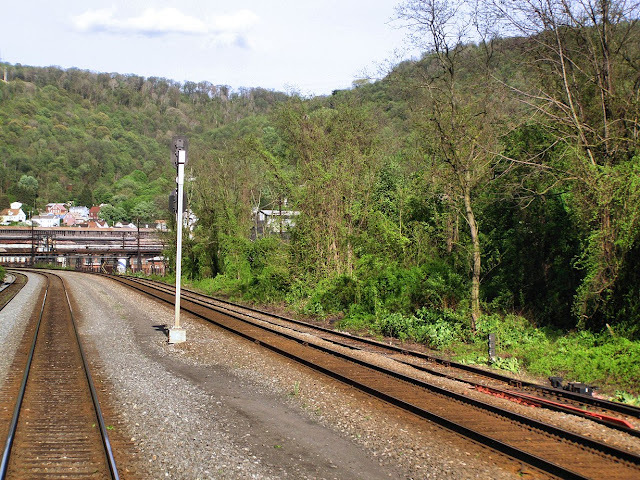 The rail line is now traversing the Conemaugh River gap through a thick mountain ridge and there are no adjacent road lines or settlements. The MP 286 automatics are co-located with an AEI tag reader and the "New Florance" Hotbox/Dragging Equipment detector. This is the westbound distant to CP-CONPIT. 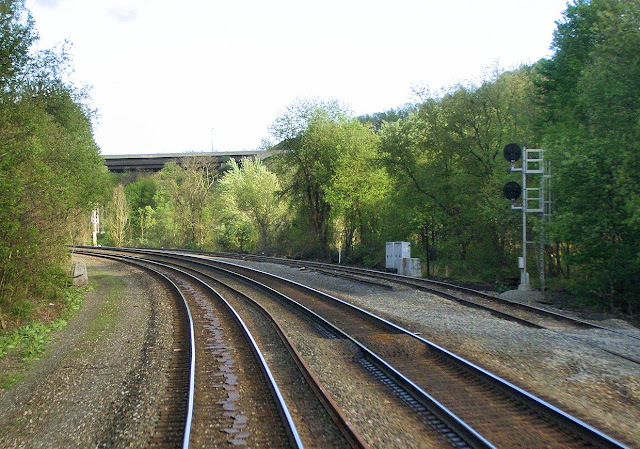 CP-CONPIT is an important junction between the Pittsburgh Line and the Conemaugh Line (hence the name). 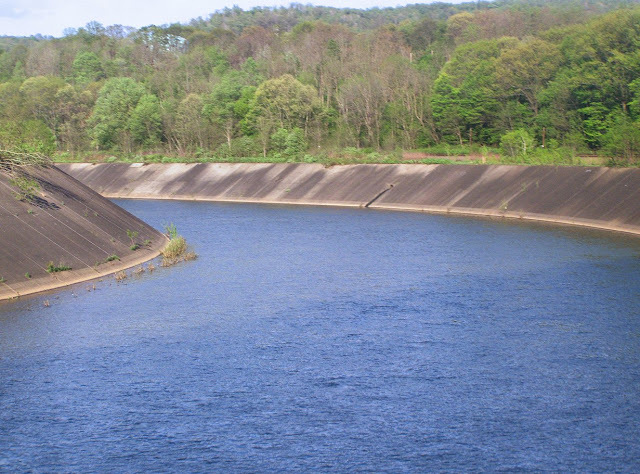 The Conemaugh Line is a low-grade route that follows the Conemaugh River to the Allegheny River and then down into Pittsburgh. The Pittsburgh Line will cut overland to Pittsburgh directly. The westbound mast signals on tracks 1 and 2 are Position Light and mount early examples of the 'C' Board you might remember from Amtrak's re-signaled Harrisburg Line. The Conemaugh Line was the PRR's experimental installation of cab-signal only operation in the late 1940's between here and CP-KISKI where the line reaches the Allegheny River. It took another 4 decades for cab signal only operation to be expanded my Conrail to some of the PRR's other former routes. Also notice that a new EMD SD70M-2 is waiting on track 3 with a mixed freight train. Between 2002 and 2004 the Caltrain commuter route on the peninsula between San Francisco and San Jose underwent a near total rebuild to bring it up to the same high tech standards as many of the companies that had their headquarters adjacent to its tracks. At the turn of the 21st century the line was operating much as it would have been at the turn of the 20th with basic single-direction Automatic Block Signal operation with hand operated crossovers at temporary block stations where orders would have hooped up to trains during single line working. 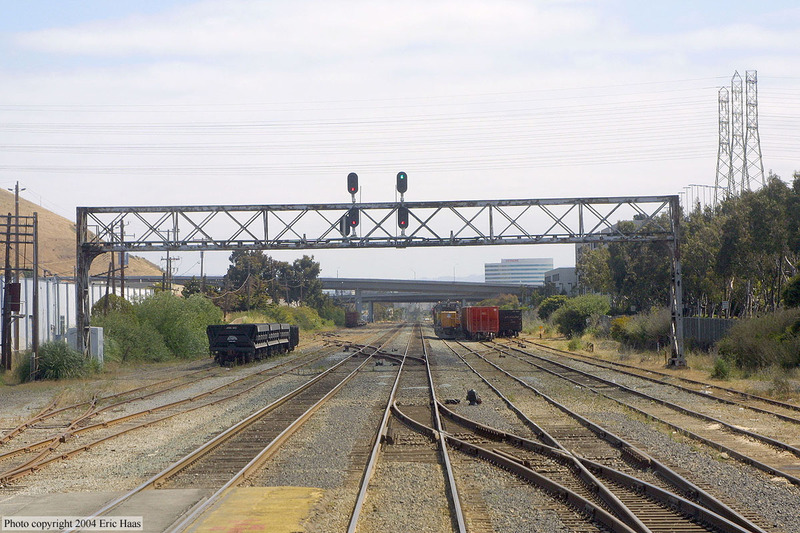 Much of the line still used jointed rail and there were only five interlockings on the entire route clustered at the north end near San Francisco, one of which was the 4th and King St terminal and the three of the remainder being used by freight trains accessing spur tracks. Fortunately for history the line was documented by a West Coast signal fan and you can see his work here. Two years later the line could not be more different. 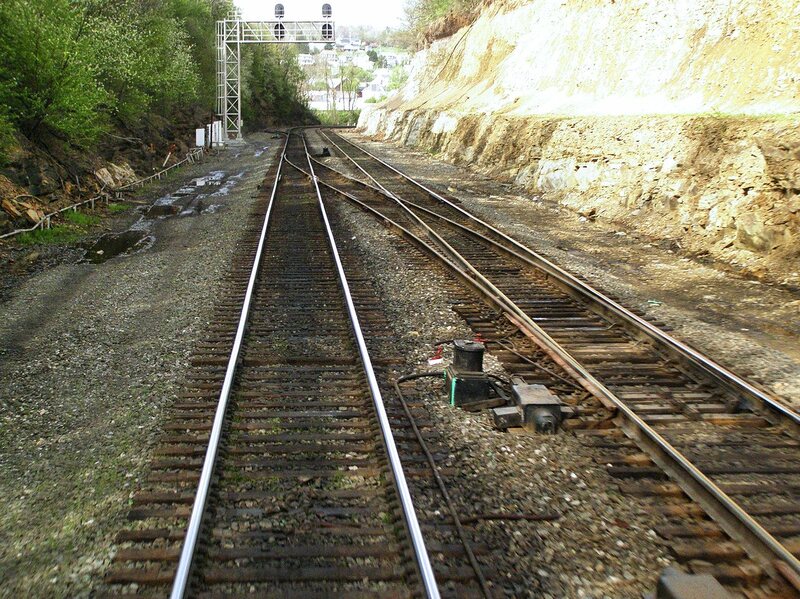 It was upgraded to fully bi-directional CTC operation with welded rail and large sections with concrete ties. Stations were rebuilt and two long 4-track passing sections were constructed near the Northern and Southern portions of the line to allow new express train services to pass locals without delay. A plethora of new interlockings were installed to allow 2-track express passing or just easy recovery from engineering works. Again, all of these changes were documented by the same signal fan. What is perhaps more interesting is that as Caltrain owned the tracks between CP-COAST and San Francisco it was free to make the decision to abandon the old Southern Pacific inherited 'route' signal rules and adopt more modern speed signal rules comparable to those seen in the east. As Amtrak had the long term contract to run the Caltrain services this better fit its operating practices elsewhere in the country. The old route style signaling had been popular back when interlockings were few and far between and traffic densities light, but with increased routes and higher speed differentials Caltrain dumped the whole route concept and adopted a speed signaling scheme influenced by prior art, but with its own unique flavour. The Caltrain signal rules can be found its the following rulebook documents. Also included are the Union Pacific route signaling rules still in service on the UP owned portions of track so you can compare and contrast. So what is interesting is that Caltrain started with the typical "Northeast" style signal set with Y/Y as Approach Slow and *Y* as Advance Approach, but dumped the use of "bottom yellow" in Restricting signals, using *R* instead. With bottom yellows now free R/Y and R/R/Y could be tasked to Medium and Slow Approach. The system retains some Western influences with the Approach Restricting aspect and Caltrain also added some innovative new aspects such as R/*Y* as Limited Advance Approach, R/R/*Y* as Slow Advance Approach and R/Y/*R* as Medium Approach Restricting. They also logically extended the Northeast style system by using R/Y/Y as Medium Approach Slow. Because no automatic signal aspect requires 3 heads (a problem caused by using Y/R/G for Approach Slow) Caltrain was able to adopt a uniform visual aesthetic for its signals (probably to the delight of its vendor, US&S) by fitting all standard block signals with 1 head, distant signals with 2 heads and interlocking signals with 3 heads. Each head in turn was fitted with all three lamps, if they were needed or not. This gives the engineer an easy way of identifying what sort of signal they are facing, even if it means Caltrain spent a lot more outfitting signal lamps that would never need to be illuminated. On some of the 4+ track home signal gantries this can lead to quite the interesting Christmas Tree effect, especially when flashing aspects are involved. This brings us to our main feature. Back in March I was out in the Bay Area for a conference and I was able to capture video from the north-facing railfan window of a gallery car of the entire line. Now this consists of about 40 minutes worth of video showing nothing but Clear signals and is probably something you don't really need to see, however I later filmed a second partial run at night where my express train takes the Bayshore passing route for some reason which shows off some aspects other than Clear. Also in evidence are the numerous grade crossings (including pedestrian grade crossings at stations which the trains have to whistle for) and this really cool Southern Pacific era 8-track signal gantry that was fitted with new signals and left in place. In that same area you can also see the last hand operated crossovers on the line used by local freight trains to switch between goods sidings that straddle the main line. There is a gap between the way caused by my camera batteries running out. In the second video you can see the new Lunar White marker lights that were attached to the signals in the terminal area for some reason. The terminal is the only un-resignaled portion of the line retaining its original Southern Pacific searchlights and pneumatic point machines (possibly the only pneumatic points west of Kansas City) and the Lunar Markers may be to differentiate the special case terminal signals with the new speed signaling system. Anyway, I hope you all enjoy the video and see that converting to Speed Signaling is an achievable goal. We all know the railroads have been in overdrive lately resignaling even perfectly functional interlockings on non-pole line CTC routes. Well I have managed to find one small silver, or should I say blue lining to all of this. 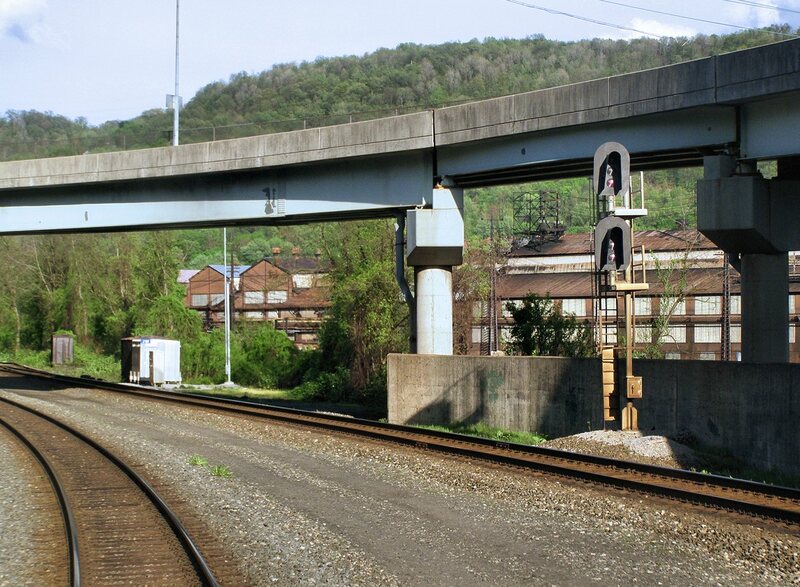 Recently NS re-signaled three interlockings on the western end of the Conemaugh Line near Pittsburgh. 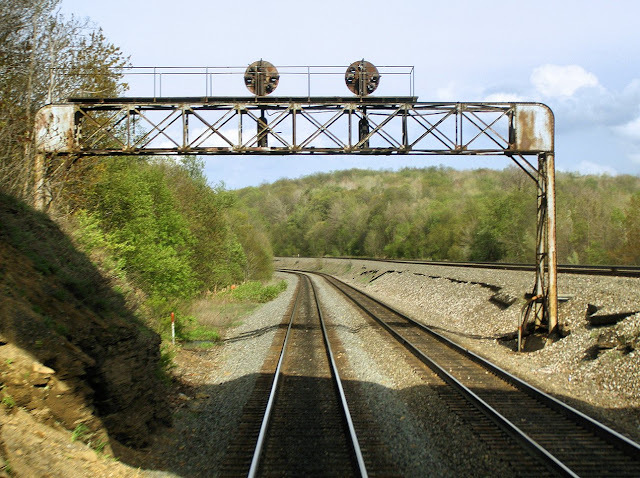 CP-HERR, CP-ENTA and CP-SHARP were all Penn Central era interlockings with mostly solid steel signal gantries and cantilevers, position lights and pneumatic point machines. Well NS removed the whole lot as they reconfigured Enta Yard. However at both rebuilt interlockings NS bothered to install brand new Conrail blue location signs on the relay huts. I guess its a nice thought, but I would have preferred they leave the interlocking appliances alone to begin with. Here we see the original relay hut with the new cantilever mast. And the new relay hut with the new sign. 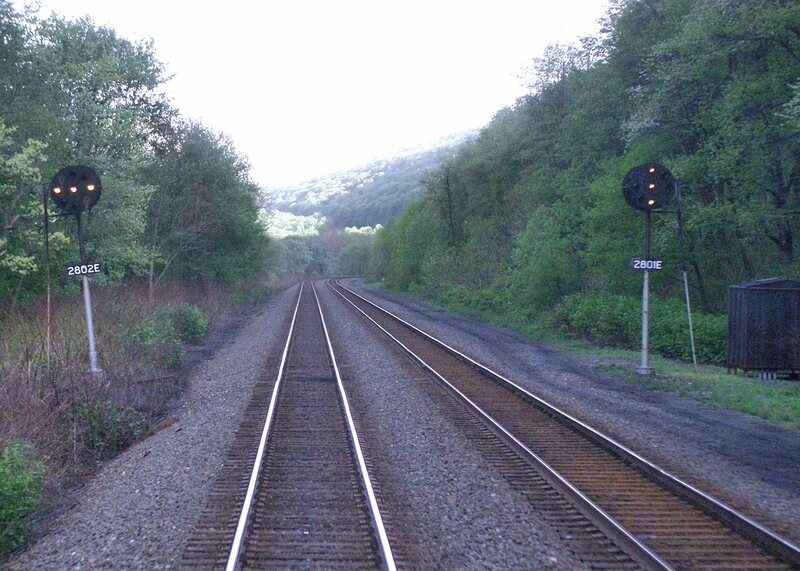 Well we have reached the summit of the PRR at Gallitzin and it is time to coast down the West Slope. While not as dramatic as the East Slope and its Horseshoe Curve the West Slope is still a helper district, is three tracks and has a good bit of cool signaling. The following track diagram will apply to this part. 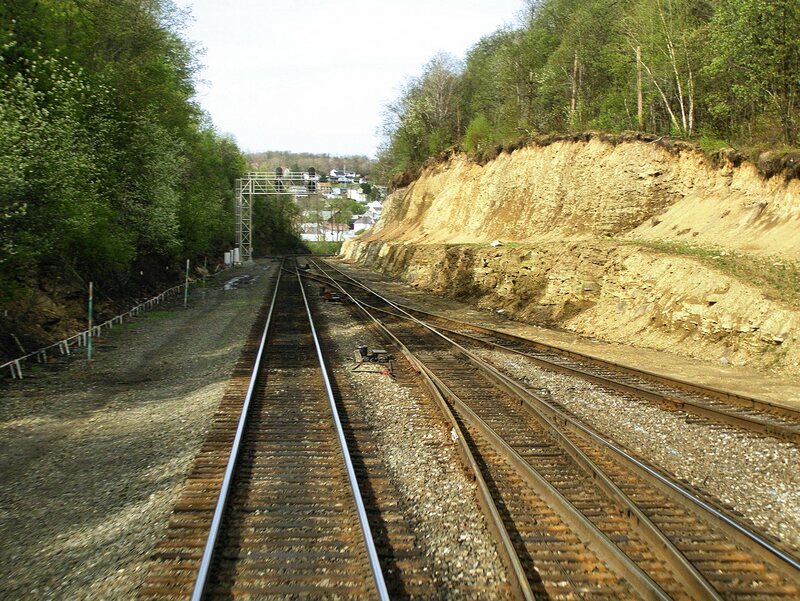 The summit of the Alleghenies, like most mountain railroad summits, features a complex of tracks that enables the use of helpers to be cut off and return to base and also accommodate any reductions in main tracks due to tunnels and junctions of alternate / low grade routes. The Gallitzin Summit is not different and at one point featured all of those in a giant interlocking complex known as BN-SF-AR-UN, seen here in this 1948 chart. After a signaling consolidation project during World War 2, the entire complex was controlled from a pair of US&S Model 14 interlocking machines in a new all brick tower overlooking AR interlocking overlooking tracks 1 and 2 with a logically seperate yet direct wire controlled UN interlocking on tracks 3 and 4. East of AR and UN was the previously mentioned SF interlocking where the Muleshoe Curve route diverge and before that was BF that provided a trailing point pre-processing ladder. Today only AR and UN remain as active interlockings and the tower was closed in 1994. 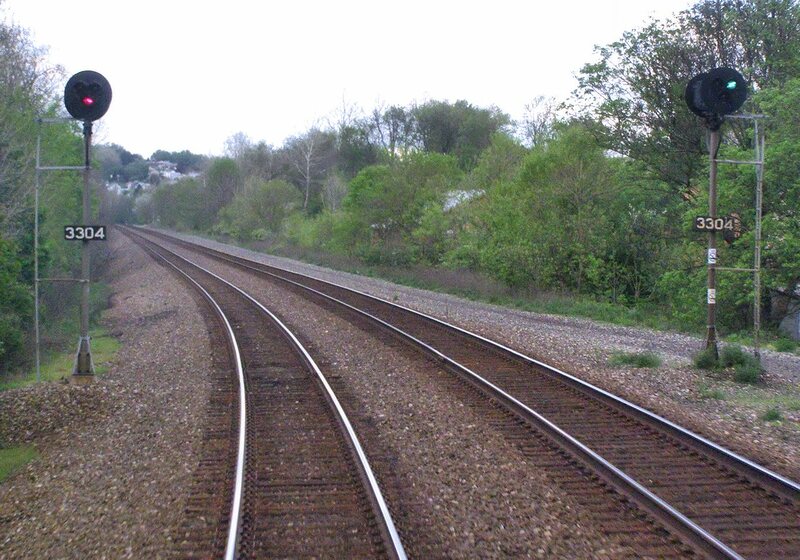 Today CP-AR serves as the eastern end of two sidings off track 1 that run between there and CP-MO. CP-UN acts as a crossover between tracks 2 and 3. Finally, between AR and UN runs a loop track that helper sets (or excursion trains) can use to turn back to Altoona after helping a westbound train over the grade. CP-UN used to have a 3-track PRR signal bridge for westbound movements, but around 2009 it was replaced by a color light cantilever due to structural issues. We can see it here with the 12W and 14W signals. #15 switch crossover with pneumatic switch machines. The slow speed loop track splits off between the two crossovers on the #11 switch. The relay hut is located in the crook of the loop track, adjacent to the #11 crossover. The restricting-only 14E reverse direction dwarf follows immediately on the Rule 251 West track #3. Around a bend sits the 12E-1 signal sitting all alone on a 2-track PRR signal gantry. The lower head only offers a Restricting indication as the only routes available are straight ahead or against the flow of traffic on track #3. Back in the day this used to support two semi-automatic exit signals for westbound movements. After leaving CP-UN we pass under the 2493 automatic, which is for westbound movements on tracks 3 and 4 only. Yes you heard me right, between CP-UN and CP-MO the tracks are renumbered 0 through 4 due to the presence of two siding tracks on the other alignment and thus track 3 becomes 4, 2 becomes 3 and we have a new tracks 2 and 0. 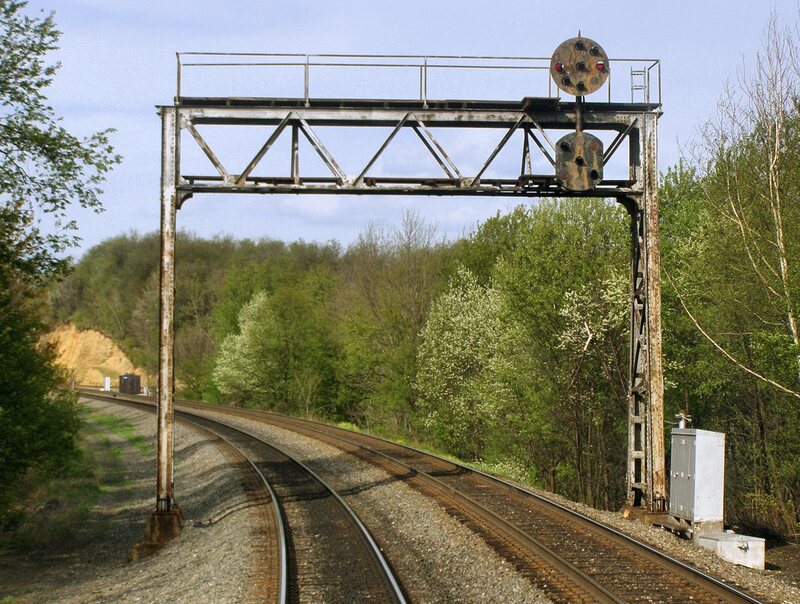 This automatic is also distant to CP-MO, mounted on a two track late model gantry and if you look at the bottom | you can see the old mounting bracket for a Limited speed triangle. Last May Metra closed the last interlocking tower on its Electric Division running south out of Chicago. This was the former Illinois Central suburban routes electrified at 1500 vDC in the 1920's. Like many other high density suburban routes the Metra Electric continued to rely on on manned towers well into the CTC to deal with the traffic volume and complexity of operations. However over the last few years Metra has invested in closing the 3 towers on the line, Randolph Street (terminal office with some sort of relay machine), 67th St and Kensington. Now I had always assumed that Kensington Tower would be the last to go because it was arguably more complex and also involved a crossing at grade of the CNIC freight main line by the South Shore Line, which diverged from the Metra Electric line there. Because of the three separate entities involved I figured a fight over funding and service quality would keep Kensington open. I was also under the impression that 67th St was some sort of more modern type relay based machine and Kensington was an ancient GRS pistol grip frame as that was how each was listed on the large Jon Roma list of towers. Turns out I had it completely backwards. Kensington had been converted to a relay plant controlled by a GRS TrafficMaster CTC console (and was originally a US&S plant), while 67th St had the GRS machine. Also I thought 67th St was some small office buried somewhere around the junction, while in reality it was a full on tower hiding in plain sight next to the tracks. I just never noticed it. 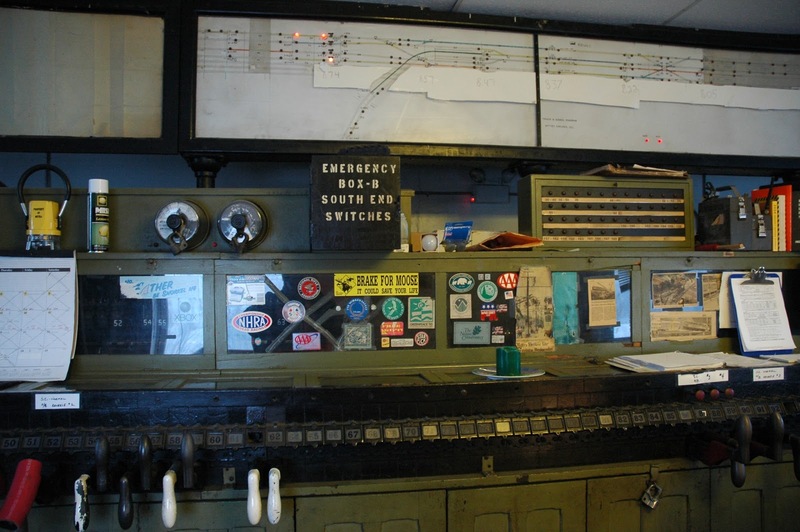 Anyway, I spotted this Blog piece on the closing of the last of the Metra Electric div towers and along with a good history of the tower (which you should read) there was a very tantalizing interior photo of the GRS Model 5 machine inside. I managed to track down the man who took the photos who was nice enough to send me his whole set on CD with permission to post them online and use them in my photo essays. The photos have been unmodified (apart from renaming) and left at their original resolutions to preserve the details inside the tower so you might want to click "View Image" to get the full amount of detail. The entire set may be viewed here. 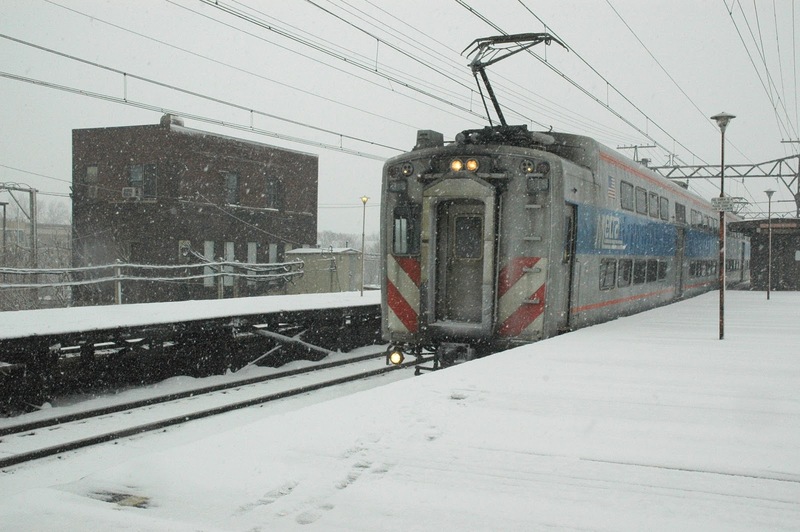 Jumping right in, here is the best photo of 67th St that was provided showing a Metra Highliner EMU making a station stop in fairly typical Chicago weather. The tower is a large rectangular monolith with no typical "tower" accouterments, which is why I probably mistook it for a substation. What gives it away however is the massive arm bundles of signaling wires running out from the tower onto a local concrete pole line. 67th Street is located at the junction of the IC Main Line and the electrified South Chicago Branch which runs to a station only a short distance from the Quad Draws at CP-509. I should probably provide a little reference at this point. Here is a line guide to the Metra Electric division. There is an updated track chart at the bottom showing current CTC (red) and ABS (green) territories. 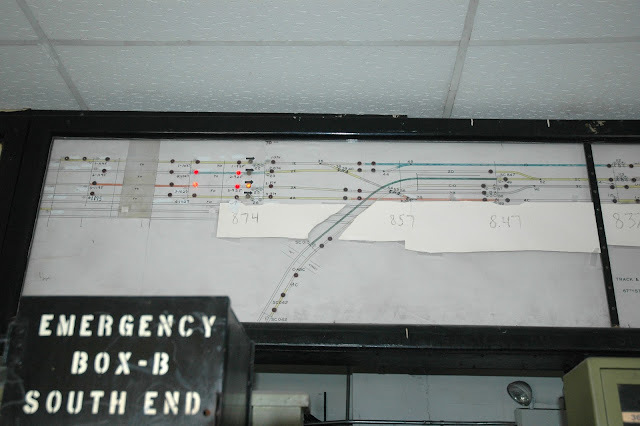 both 67th St (MP 14) and Kensington (MP 19) interlockings used to be blue, indicating tower control. Express tracks are on the outside, local tracks on the inside serving island platforms. The tracks between 67th St and Kensington was upgraded to bi-directional operation some time ago, but between 67th St and Chicago it remains ABS. Moreover, between Roosevelt Rd and the Randolph St terminal, trains work on sight within unsignaled yard limits with hand operated points. Back to the tower we head to the top floor where we find a surprisingly large 176-lever GRA Model 5 pistol grip style interlocking machine. 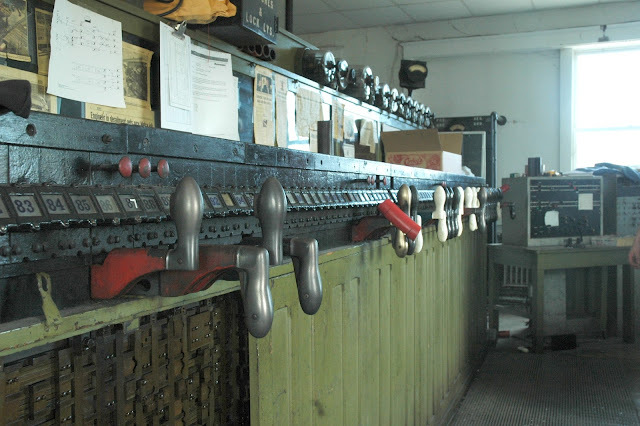 While only a small fraction of the levers were in use at the time of its closure, back in the day the tower would have also had control of the 4 parallel freight tracks. Here we have the left side of the machine starting at lever 1. And continuing to lever 176 on the right. As per standard practice red levers are signals, black the switches. Here is some detail of the 8x levers. Pulled out from the machine displays a signal or reverses a switch. The small button on the pistol grip is not interlocked, but instead is covered by any blocking device. The red buttons are for displaying a call-on signal. View along the levers showing the glass top of the machine and a scented candle. One wonders how often that glass top needed to be repaired in the 80 years the tower operated. Here is a view of the machine straight on. From top to bottom we have the illuminated track diagram, then the row of signal rundown timers (supplied by US&S) with an emergency switch release box. then a glass fronted case switch and signal fuses and finally the levers. Is it just me or are the stickers on the fuse case sending some mixed messages? Here is the right side of the track diagram showing off the north end of the interlocking. This consisted of a 4-track double slip scissors crossover employing levers 132 to 176. As the route north of here is ABS the tower only has full occupancy lights on the southbound tracks. Below the diagram is a display showing which levers are currently locked out, next to some truly ancient portable radios. The left side of the track diagram shows off the south end of the interlocking which consists of a duckunder junction for trains proceeding down the South Chicago branch. Main line local train must make a diverging movement at the split. Past the South Chicago split we see a double slip trailing ladder allowing express to local crossover. Also note the traffic flow indications for the bi-directional territory south of 67th St.